Spray applied radiant barriers are much more affordable than fabric radiant barriers or spray foam barriers. Minimum odor that dissipates quickly after spraying. A product that is breathable & inhibits mold growth..
Increases the Value of existing insulation. Reduces attic heat and will increase the longevity & efficiency of your HVAC unit. Lasts for many years and increases the value of your home. Makes for a more comfortable home to live in. It is a green product because of the power reduction it creates. It can be used in most hard to reach areas. 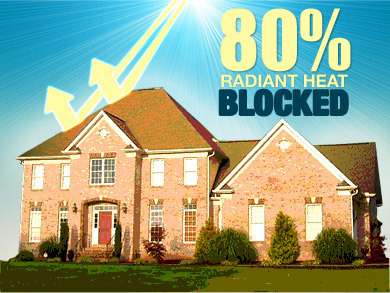 Also works in the cold months by radiating 80% of the house's heat back into the house. Spray Applied Radiant Barrier is perfect for someone looking for an alternative product to foam without the sticker shock of foam. In new construction they are using radiant barriers laminated or sprayed to the lumber applied to the roof. But in existing homes there is not any easy solution until now. Our product sprayed on the roof deck just like foam will block the radiant heat while the insulation does the rest giving you a savings up to 30% for a fraction of the cost. It is also a green product saving energy year round. It has a very low V.O.C (Volatile Organic Compound) and the smell dissipates over a day or two. It costs a fraction of what foam costs for very close to the same results. It installs quickly without a mess. Does not perform as well as foam insulation. Will not completely seal off an attic. Is not a sound barrier. Spray Foam Insulation whether it be open or closed cell is a great product for new construction. It is a radiant barrier and an air barrier. It also saves energy. It can be applied to the roof deck, walls and floors, and is a good sound barrier. Spray Foam Insulation is not as easy in an existing home. First you have to remove most of the existing insulation from the attic costing you money. Next you have to spray the roof deck and gables completely sealing off the attic so that it will have absolutely no more air flow. The smell and fumes created are enough to drive your family out of the home for days and will aggravate allergies including pet allergies. There is a much higher cost to remove existing insulation and foaming an attic.